Here's a dessert that's fit for company, including for the just-around-the-corner holidays. If you make these brownies rather than buying ready-made ones, the result will be significantly healthier. But let's not kid ourselves about the health profile of the recipe, another contribution by my friend Mary Ann Barnes, who has a raging sweet tooth. (She seems to spend a lot of her time figuring out dessert recipes that substitute healthier ingredients for the fats and sugars in standard sweets.) Like most desserts, this is a once in awhile indulgence! Combine instant pudding mix and fat free milk, whisking until thickened. Add thawed whipped topping and peanut butter, stirring until smooth. Layer ½ brownies on the bottom of a large glass bowl, pressing to fill any holes. Arrange slices of bananas on brownie layer. Spoon ½ peanut butter mixture over bananas. Repeat layers. Sprinkle chocolate covered peanuts on top, if desired. Refrigerate until served. Pulse black beans in a food processor until smooth. Add flour, eggs, cocoa, sugar, Smart Balance, vanilla and grapeseed oil; process until smooth. Pour mixture into a medium bowl. Add baking powder and chocolate chips, stirring until blended. Pour mixture into baking pan, and bake for 30 to 35 minutes, or until toothpick inserted into center comes out cleanly. 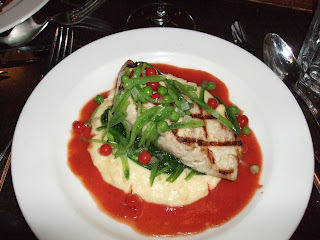 I had a couple of very good dining experiences this past weekend, and I'd definitely recommend both of these restaurants: Rue Dumaine in Centerville (near Dayton) and Rookwood Restaurant in Mt. Adams (Cincinnati). Rue Dumaine was a surprise, basically because I was ignorant of its existence. I drove up from Cincinnati with two friends, and all I knew in advance was that this is a French restaurant one of my friends had tried once and liked. Then on Sunday I went with my husband and another couple to Rookwood Restaurant so that we could enjoy their terrific deck while the weather is still warm enough. Once again, a highlight is their interesting cocktail list. There's a wood-burning grill on the deck that imparts amazing flavor to whatever comes off it -- mostly burgers and skewers of different meats and seafood. I indulged in a burger, which was excellent. 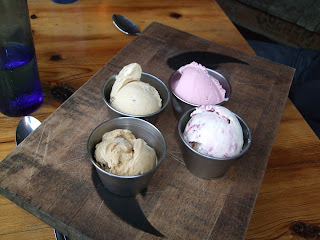 Also pictured, the haricots verts salad and a sampler of Jeni's ice cream, that stellar stuff out of Columbus OH. Is it really possible to make a healthy -- or at least, healthier -- version of this indulgent cake? 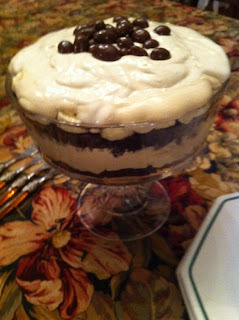 According to my friend Mary Ann Barnes, who sent me this recipe, the answer is yes. Mary Ann is a master at having her cake and eating it too. That is, she's figured out healthy substitutions for so many of her favorite dessert recipes, enabling her to feed her sweet tooth without too awfully much guilt. Preheat oven to 375 degrees. Coat a 13 x 9 inch cake pan with cooking spray and dust with flour. In a large mixing bowl, mix egg substitute, sugar and vanilla until light and creamy, about 3 minutes. Add baking powder, salt and sugar. Alternately add milk and flour, about 1/3 at a time, mixing after each addition. In a small bowl, whip dried egg white with water until stiff peaks form, about 2 minutes. Fold into cake batter. Spoon cake batter into prepared pan and bake for 20 – 25 minutes, until wooden pick inserted into center comes out clean. Cool for 10 minutes, then invert onto cake platter. Prick bottom of cake many times with a fork. In a medium bowl, combine condensed milk, evaporated milk, fat free milk and rum. Whisk until smooth. Slowly pour milk mixture evenly over cake. Cover with plastic wrap and refrigerate for at least 4 hours, or overnight. In a medium bowl, whip dried egg white and water until stiff peaks form. Meanwhile, combine salt, sugar and water in a small saucepan. Cook over medium heat, stirring occasionally until sugar is dissolved. Continue cooking until mixture boils for 4 minutes, without stirring. In a steady thin stream, pour syrup into egg whites while beating. Add vanilla. Frost cake. Refrigerate until served. One of the best gourmet-to-go dishes at Fresh Table (Findlay Market) is corn pudding. But it is not a guilt-free indulgence. This version lightens things up by using nonfat dairy products and less oil, but you still get the vitamins and fiber -- not to mention delightful taste -- of the corn. Preheat oven to 350 degrees. Spray a 7 x 11 inch baking dish with cooking spray. Blend cornmeal, sugar, baking soda and salt in a large bowl. Process buttermilk, sour cream, egg substitute and spread in blender until smooth. Add corn and process about 10 seconds more (mixture will be lumpy). Whisk buttermilk mixture into cornmeal mixture. Pour into prepared baking dish. Bake 35 – 40 minutes, until edges are browned and center is set. Cool at least 15 minutes before serving. Eggs really do qualify as a superfood. A partial list of their health benefits includes: high-quality protein and all nine essential amino acids; protects your eyes from macular degeneration and cataracts; good for your nervous system thanks to their choline content; they contain Vitamin D...and they are inexpensive, easy to prepare and amazingly versatile. I love this preparation, which has the added enhancement of including another superfood, spinach. Preheat oven to 400°F. Toss crumbs with 2 teaspoons mustard, 2 teaspoons oil, and mustard seeds in medium bowl to coat. Scatter on rimmed baking sheet. Bake until golden and crisp, 6 to 8 minutes. Meanwhile, add enough water to deep large nonstick skillet to cover bottom. Add spinach; toss over high heat to wilt, about 2 minutes. Scrape into sieve set over bowl; press out liquid. Wipe out skillet; reserve. Transfer spinach to medium saucepan. Add 3 teaspoons mustard, half and half, and chopped thyme. Stir over medium heat until thick, about 3 minutes. Season with freshly ground black pepper. Remove from heat. Heat remaining 1 tablespoon oil in reserved skillet over medium-high heat. Crack eggs into skillet, spacing apart. Fry until whites are cooked through, 3 to 4 minutes. Divide spinach between 2 plates, spreading out as base for eggs. Top with eggs, crumbs, and thyme sprigs. In the realm of wine, for me it just doesn't get any better than vin francais. At home this week I've enjoyed a 2009 Sancerre (Loire Valley sauvignon blanc) and delighted in a 2009 Fleurie (a cru beaujolais). And if I were stranded on a desert island with only one type of wine, it would be French Burgundy -- the reds made from luscious pinot noir, the whites the best chardonnay in the world. Of course, sparkling wine from Champagne out-classes sparklers from anywhere else, and it's very high on my list of favorite wines. Food & Wine is featuring wines from France, with lots of info about the seven major wine producing regions from that lovely country, on its website this week. Below are a few excerpts, or go here to read more. See also this impassioned essay about why French wines are still unparalleled. The Champagne region's wines are usually blends of different grape varieties (Pinot Noir, Chardonnay and Pinot Meunier) from different years and different vineyards, combined to create consistency, vintage after vintage. The result is that despite this northern region's marginal and unpredictable climate, Champagne is incredibly reliable. Burgundy, in north central France, is home to the world's most frustrating, unpredictable and—when everything goes right—glorious wines. The unpredictability of Burgundy wine is largely due to variable weather; it's hard to think of a region with as much difference between vintages. But people who love Pinot Noir (red Burgundy) or Chardonnay (white) owe it to themselves to investigate the Burgundy wine region—and not to forget Beaujolais, whose Gamay-based reds are some of the world's best wine values. I've been a tea drinker all my life, and couldn't appreciate coffee at all until I reached my 30s. 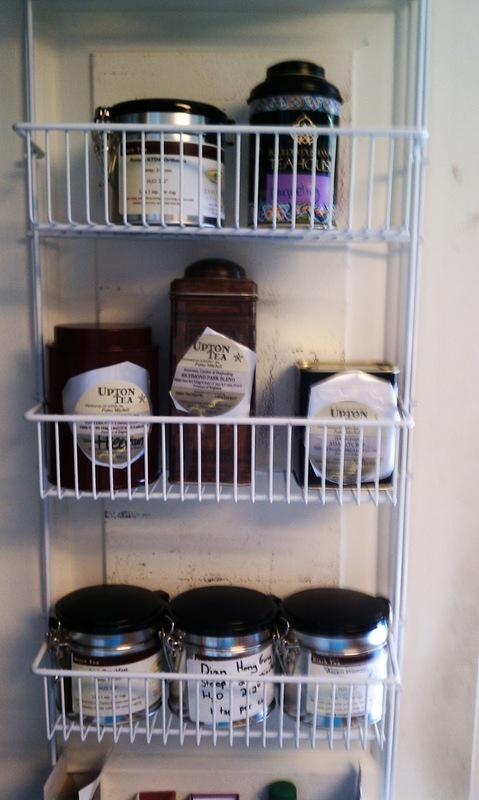 To this day, I brew a pot of loose-leaf black tea every morning -- there are no tea bags in my pantry, but many tins of various black tea leaves. I love to buy tea on my travels, especially at famous teahouses such as those in Paris or Boulder CO. But the main sources for my breakfast teas are Essencha Teahouse and Tea Shop in Oakley (Cincinnati) or the terrific mail-order tea supplier, Upton Tea. Being such a purist, I haven't tried bottled teas very often, and those that did pass my lips were nothing special. Recently, however, I learned about Ohio-based Tradewinds bottled tea, operating out of Carlisle, just south of Dayton. They make eight flavors of iced tea, from sweet tea to lemonade tea, raspberry tea, unsweetened tea and green tea with honey. To my surprise, my favorite so far has been the green tea (which also comes in diet). It tastes like honey, not green tea -- which I don't care for, as a rule. Most of the sweetened teas have 70 calories per serving; however, as is often the case with bottled drinks, the fine print on the bottle confesses that it contains 2.5 servings, so I wouldn't drink the whole thing at once. Tea contains flavonoids, naturally occurring compounds that are believed to have antioxidant properties. Antioxidants work to neutralize free radicals, which scientists believe, over time, damage elements in the body, such as genetic material and lipids, and contribute to chronic disease. The antioxidant properties of tea flavonoids may play a role in reducing the risk of cardiovascular disease by decreasing lipid oxidation1 , reducing the instances of heart attacks and stroke2,3, and may beneficially impact blood vessel function , an important indicator of cardiovascular health. Tea flavonoids may lower the risk of certain cancers by inhibiting the oxidative changes in DNA from free radicals and some carcinogens1. Tea may also promote programmed cell death, or apoptosis5, and inhibit the rate of cell division, thereby decreasing the growth of abnormal cells1. Tea-drinking has been associated with oral health6 and bone health7. Compounds in tea other than flavonoids have been shown to support the human immune system8. The shoulder season between the dog days of summer and the nip of full-on autumn is a perfect time to explore lighter red wines such as pinot noir, sangiovese or (a rediscovered delight) cru Beaujolais. The Beaujolais area of France lies between two more widely known wine regions, Burgundy and the Rhone Valley. Almost all of the red wine produced in this 30 mile-long valley comes from the gamay grape. And the best wines carry the "cru" designation, meaning they each hail from one of ten villages (a list of which I'll post below). In these small towns and rural areas, winemakers turn out carefully crafted table wines that often achieve a pretty balance between fruitiness and depth. I've found that they pair wonderfully well with anything from shrimp cocktail to turkey or bison burgers, roast chicken, or a hearty vegetarian stew heavy on winter squash or mushrooms. Note: the word "Beaujolais" is not required to be placed on the label of these wines. Reliable top crus, year after year, are Morgon and Moulin-a-Vent, but any town of origin is worth a try. Georges DuBouef is the beaujolais producer with the longest reach into the American market, and it's not hard to find their Morgon, Julienas or St. Amour, among others. 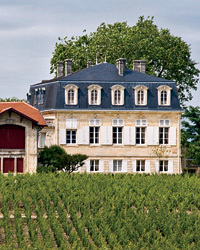 Louis Jadot is another major producer with cru beaujolais distributed widely in the U.S. In addition to these wines' versatility at the table and their pleasing mouth-feel, they tend to be moderate in alcohol content (around 12 or 12.5 percent) and inexpensive for the quality level. You should be able to find a cru beaujolais you'll love for anywhere from $13 to $20, with some highly rated (by the wine press) Morgons inching toward $30. The 2009 vintage was spectacular, so look for that. Because beaujolais tend to be underappreciated, your wine shop might have a couple of dusty bottles on the shelf. That vintage produced wines with enough depth and structure to improve for a couple more years, although they're terrific now as well. 2010s should be widely available, and it too got good reviews, although these tend to be fresh and fruity -- at least compared to the 2009 wines -- and ready to pour with dinner tonight. 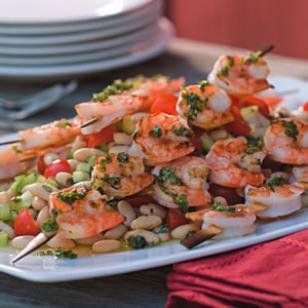 From Eating Well magazine -- a great favorite -- here's a recipe for grilled shrimp skewers served over a light, summery bean salad. Sea scallops work just as well as the shrimp, or you can alternate the two shellfish. Chunks of swordfish or other firm fish would be tasty, too. Most people may not read the alcohol content info on the bottle of wine they're pouring with dinner, but in fact the trend among winemakers worldwide for the past decade or more has been to kick up the alcohol percentage in many if not most bottles. That's as true for everyday, low-cost chardonnays and cabernets as it is for cellar-worthy "investment" wines we save for special occasions. However, for the sake of your health, it's not a bad idea to seek out lower-alcohol wines if you're drinking at home or in a restaurant. The difference between a pleasant night out and a DUI can hinge on whether the bottle you chose for dinner came in at 12% or 14-16% alcohol. It doesn't sound like much of a spread but in fact a couple can share a bottle of Sancerre (a French sauvignon blanc, about 12 percent) and not be intoxicated. If they'd downed a bottle of almost any California cabernet or zinfandel, however (at least 14.5 percent), they could be a danger to themselves and others if one got behind the wheel. Another bonus: there are significantly fewer calories in lower alcohol wines. 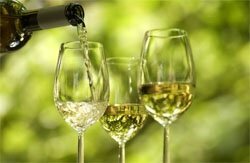 The Portuguese white wine, Vinho Verde, comes in as low as 8-9% alcohol, as do some Italian sparklers such as Asti Spumanti or Moscato. German rieslings also tend to contain only 8-10 %. For more suggestions, see The Kitchen blog (click on the link to go there). Thanks to an unusual set of opportunities, during just over a week I dined at four notable restaurants, at least 2-3 of which would be on most people's lists of the best in Cincinnati. Based on those four dinners and considering all factors but most especially the quality of the food (always my top rating criterion), here's how they ranked. Note that #4 is a brand-new wine bar/light-bites enoteca and doesn't have the same aspirations as the others. 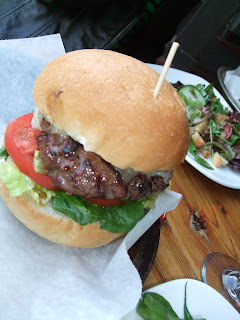 This was my one and only visit to Enoteca Emilia, while I've dined many times at Local, La Poste and Jean-Robert's. You might be surprised that the Table ranked as #3, but my dining companions pretty much agreed that the food was fine, but didn't knock us out. 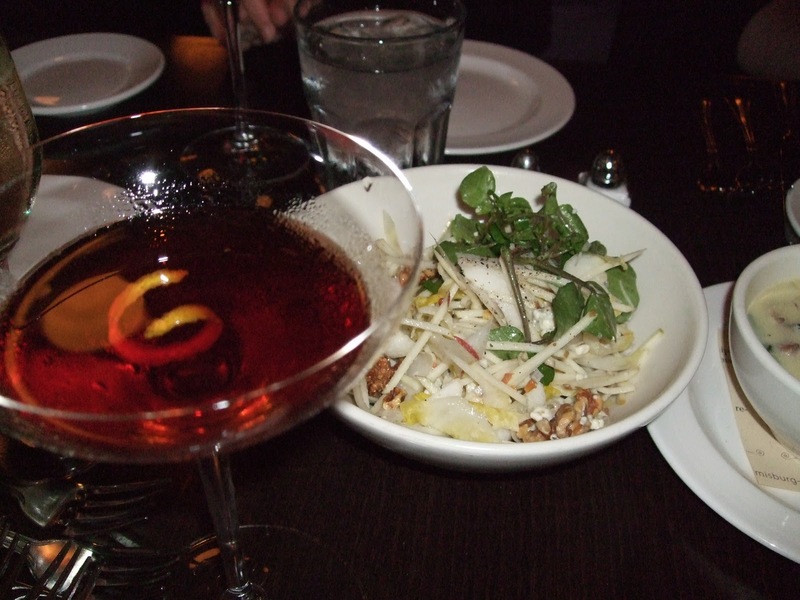 On the other hand, the same bunch had dined on separate, recent occasions at Local 127 and raved -- if not dreamed -- about at least one thing they ate there. For me, what disappointed at Jean-Robert's was my entree, a seasonal special of soft shell crabs. I love those little devils when they are cooked properly -- flash fried and as crispy as popcorn -- but so many restaurants just don't deliver. I decided to trust Chef de Cavel, and alas, he (or whoever on his staff actually prepared them) failed. The crabs looked crispy when the waiter set them before me, but then he poured a sauce over them that did what I dreaded: made them soggy. At La Poste just the night before, I had a light meal of melon/tomatillo gazpacho and a bowl of delicious mussels and clams. Clearly not as ambitious as what de Cavel does, but every bite was perfection. I've written (below) about my terrific dinner at Local 127 a week earlier, where my friend and I oohed and ahhed our way through entrees and a cheese plate, accompanied by cocktails and wine. 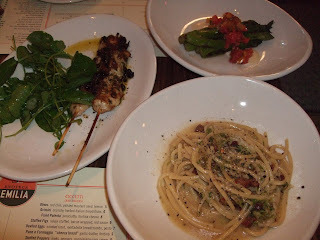 I also blogged about Enoteca Emilia, so if you care, scroll on down to read about that. 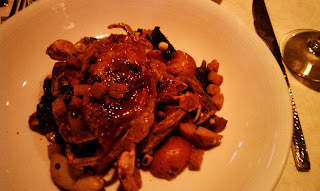 Table service: Local 127 -- excellent; La Poste -- excellent; JR's -- very good; Enoteca -- very good. Wine/cocktail selection: Local -- excellent; La Poste -- excellent (especially wine); JR's -- very good; Enoteca -- good. It's all Italian, from the salumi and formaggi (cured meats and cheese) pre-appetizers through the spiedini (grilled skewers of meat and garnishes), pasta, artisnal pizza and wines ranging from soave to amarone. Enoteca Emilia at 2038 Madison Road has been open just since mid-August and it doesn't yet have a website, although you can find them on Facebook. We dropped in for dinner the other night and tried a few items, beginning with a lovely Principessa Gavi 2010 (mine) and a glass of Abrigo Rosato Dolcetto 2010 for my companion. She ordered deviled eggs for a quick nosh -- three eggs each garnished with a tasty topping, a bit pricey she thought at $7. 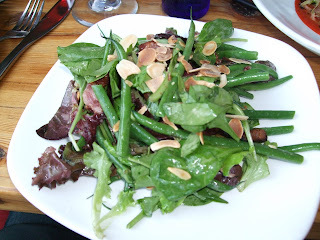 After that, we split three dishes: asparagus salad with an heirloom tomato vinaigrette -- the lightest and for my taste the best thing we ate. Again, she thought it was good but that $10 was too much for the portion. Along with that we split a rich, buttery Bucatini pasta with prosciutto, white wine, a tiny bit of frisee lettuce (I wished for more of that) and a side of roasted cauliflower, also a bit too rich with olive oil for my waistline. We spoke with owner Margaret Ranalli after we ate and found her open to our feedback. She also said the restaurant had started well and she felt good about the community's reaction thus far. My friend and I agreed we would both return. I'd like to try the pizzas and more of the pastas, and would definitely order the asparagus salad again. There are enough interesting Italian wines -- not a strong suit in my wine knowledge -- to entice me back, as well. The space -- formerly Brickyard Pizza -- makes for a pleasant, open ambiance. It's definitely a good addition to the neighborhood, and Cincinnati needs more wine oriented places to dine. Check it out!